ZHENGZHOU, Jan. 9 (Xinhua) -- A decade ago, Lyu Xiaofang was one of millions of young Chinese women who left their rural homes to find work in distant cities. 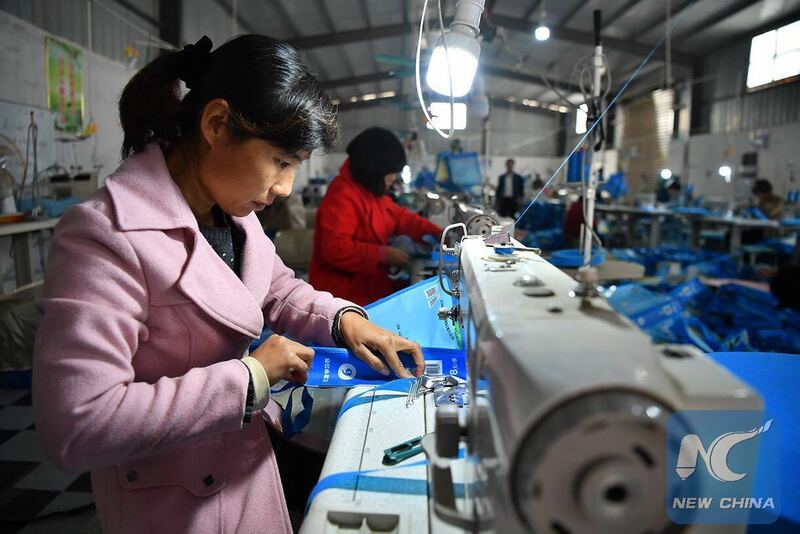 Now, the 30-year-old "migrant girl" has returned to her village in Shangshui County, central China's Henan Province, and built a business making shopping bags, enabling other village women to earn money. Wearing shiny earrings, lipstick and a stylish woolen coat, Lyu owns nine factories. In 2011, she set up the first, using sewing skills she mastered while working in the eastern?Jiangsu Province. She employs more than 300 young women from nearby villages. They sell to big name supermarkets, including Walmart and Wholefoods. Profit on a shopping bag is just pennies, but a fast worker can earn 150 yuan a day, more than 3,000 yuan a month. That's low compared to urban pay rates, but they enjoy life with their children and elderly relatives, which is a major consideration. Pregnant with her second child, Lyu says her factory schedule is aligned with that of local schools. For decades, young people have tried to flee the countryside, so long mired in poverty. Now they are harvesting opportunities there, attracting aspiring entrepreneurs to start businesses and build better lives. 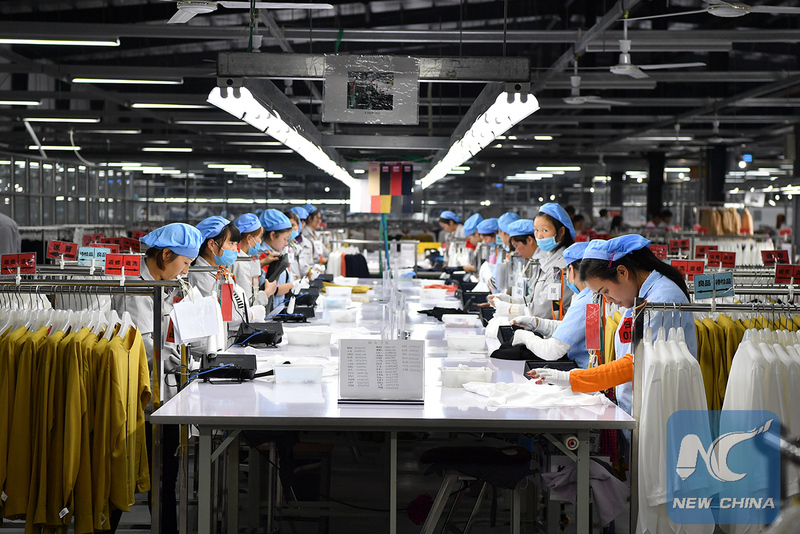 In Shangshui County, 20,000 young women work in a garment factory filling orders for Uniqlo and Zara. In neighboring Lankao County, billboards hail "Returned Business Stars" on a major road. Lankao officially rose out of poverty last year. In the eastern Zhejiang Province, people who found success in the cities are invited back by local Communist Party branches and elected as village heads to lead rural revitalization. All this has not come easily. Since the 1980s, rural China has seen an exodus of workers. Each year, a 40-day travel frenzy, known as "Chunyun", triggered by the Spring Festival, China's most important family holiday, sees hundreds of millions of people shuttle between cities and their rural hometowns. Poor infrastructure, pollution and lagging incomes drive young people away from rural areas. Most of the younger migrant workers have little experience of farming. At its 19th National Congress in October last year, the Communist Party of China (CPC) said China was facing the principal contradiction between unbalanced and inadequate development and the ever-growing demand for better living standards. Minister of Agriculture Han Changfu pointed out that the biggest imbalance was between urban and rural development, and most of the inadequate development was in rural areas. When Hao Xiangdong left his family in Henan in 2009, his village only had one road, and it was as wide as a tricycle. He saw farmers working hard, but trapped in poverty. "Growing rice was the sole income of most families." He moved south and discovered that the herb rosemary was popular with urban people. To his surprise, both the soil and climate in his hometown were suitable for its cultivation, so he moved home and started a rosemary business. Locals initially doubted the venture, but as it grew, more wanted to join it. Helped by agricultural experts, they studied new uses for the herb. Now their air fresheners, masks and essential oils are sold in Shanghai and Guangdong. Hao attributed his success to an improved rural environment, greater access to water and electricity, and better roads. The local government also offers land and credit support to village start-ups. Hao, 29, was elected village Party head and determined to develop tourism by growing a million square meters of rosemary to make his hometown rich and beautiful. The upgrade of China's manufacturing sector is also driving the return to the countryside. Due to rising labor costs in coastal areas, many industries have shifted to labor-rich inland provinces. With a population of 108 million, Henan has attracted many entrepreneurs. Their costs are lowered with the financial support of local authorities. In 2015, Ren Lianjun, 31, moved his clothing and toy factory from Guangdong to his home in Shangshui. "In the past, villagers migrated to cities to work, but now jobs are following people back to the villages," says Ren. He has 48 workshops in the county and employs about 5,000 people. Most orders come from the south. Now his workers are busy making 20,000 firefighter uniforms for Taiwan. "I used to think cities were more developed. Now I find more advantages in rural areas. I have more time to care for my parents," says Ren. The CPC at the 19th National Congress pledged to support and encourage employment and business start-ups in rural areas, and to open more channels to increase rural incomes. In Shangshui County, more than 110,000 people have found jobs in their hometown and 20,000 lifted out of poverty since 2012. "But it's far more than an economic benefit. It allows villagers to stay near their families. There are fewer children and elderly people left behind in rural areas," says Ma Weidong, Party secretary of the county. China has more than 9 million left-behind children in rural areas and the number of rural elderly living apart from their offspring is growing rapidly. 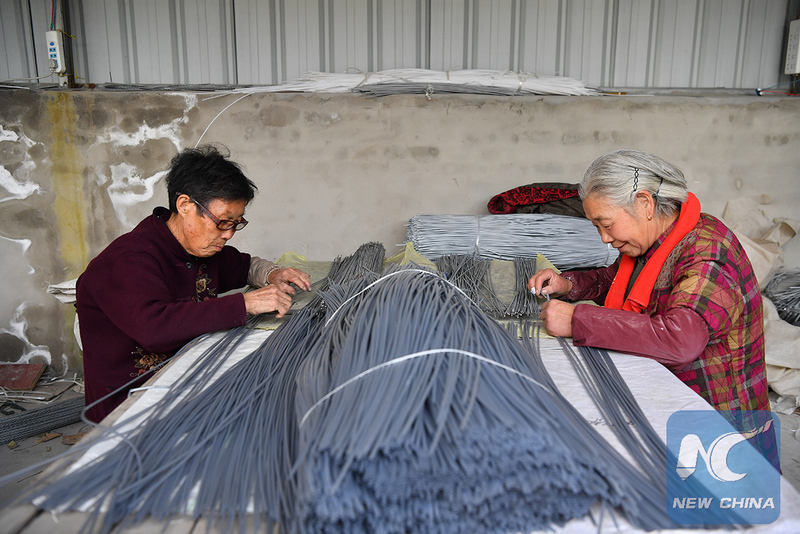 Zhao Xiuying, 77, a rice farmer for decades, never expected to find a job assembling fishing nets in a factory in her village. She says work wards off boredom and raises her income. ?Her employer, Tian Guanghui, 31, used to be a sales manager for a foreign company in the city, but chose to return to the village two years ago to start a fishing gear factory after finding how cheap labor was there. 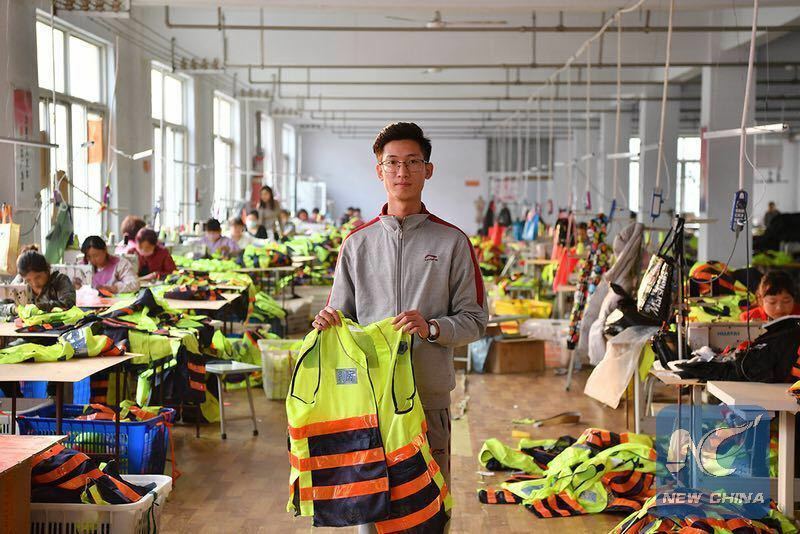 It's been hard work, but he's proud: "When my business gets better, I will invite all my fellow villagers, young and old, to work in my factory. They are the people I will never forget."